Justin Richards scored twice to help League Two Port Vale spring a shock and knock Championship QPR out of the Carling Cup in the first round. Vale started well and John McCombe headee against the bar before Richards raced clear to slot the opener. Doug Loft then played in Sean Rigg, who driving in a left-footed shot for 2-0. Richards added another when he tapped in a rebound and although Antonio German's drive went in off the post to pull a goal back, QPR were well beaten. Rangers boss Neil Warnock may rue making five changes to the side which opened the Championship season so impressively with a thumping 4-0 win over Barnsley on Saturday. And he was unable to rouse his side at half-time, with his side two goals down, and must now suffer the consequences and embarrassment of an early exit. Rangers will also look back at a disallowed goal when defender Matt Connolly thought he had halved their deficit after the break when he headed in Gary Borrowdale's corner, but referee Gary Sutton blew for a push. However, Vale were value for what is a famous win as they defended solidly to prevent their opponents scoring more than once in reply. 94:02 The referee gets the game started. 90:00+3:18 Corner from left by-line taken short right-footed by Hogan Ephraim (QPR). 90:00+2:50 Defending throw-in by Gary Borrowdale (QPR). 90:00+2:11 Foul by Jamie Mackie (QPR) on Marc Richards (Port Vale). Direct free kick taken right-footed by Stuart Tomlinson (Port Vale) from own half, resulting in open play. 89:37 Direct free kick taken right-footed by Stuart Tomlinson (Port Vale) from own half, resulting in open play. 89:37 Substitution Port Vale substitution: Gary Roberts replaced by Tommy Fraser (tactical). 89:37 Booking Jamie Mackie (QPR) booked for unsporting behaviour. 89:37 Foul by Jamie Mackie (QPR) on Kris Taylor (Port Vale). 88:57 Attacking throw-in by Kris Taylor (Port Vale). 87:10 Shot by Mikele Leigertwood (QPR) left-footed from right channel (25 yards), save (caught) by Stuart Tomlinson (Port Vale). 86:08 Goal kick taken short by Patrick Kenny (QPR). 85:17 Attacking throw-in by Hogan Ephraim (QPR). 84:26 Foul by Gareth Owen (Port Vale) on Antonio German (QPR). Direct free kick taken left-footed by Gary Borrowdale (QPR) from right channel, resulting in open play. 83:56 Goal kick taken short by Patrick Kenny (QPR). 83:17 Goal kick taken long by Stuart Tomlinson (Port Vale). 83:04 Shot by Romone Rose (QPR) right-footed from left channel (25 yards), missed right. 82:25 Substitution Port Vale substitution: Justin Richards replaced by Louis Dodds (tactical). 82:06 Outswinging corner from right by-line taken right-footed by Gary Roberts (Port Vale) to near post, clearance by Gary Borrowdale (QPR). 81:40 Shot by Doug Loft (Port Vale) right-footed from left channel (20 yards), save (parried) by Patrick Kenny (QPR). 81:11 Goal kick taken long by Patrick Kenny (QPR). 80:46 Attacking throw-in by Kris Taylor (Port Vale). 80:12 Goal kick taken long by Stuart Tomlinson (Port Vale). 79:41 Goal kick taken long by Patrick Kenny (QPR). 79:22 Attacking throw-in by Kris Taylor (Port Vale). 79:10 Attacking throw-in by Kris Taylor (Port Vale). 78:45 Goal kick taken long by Patrick Kenny (QPR). 77:12 Attacking throw-in by Romone Rose (QPR). 75:18 Foul by Hogan Ephraim (QPR) on Anthony Griffith (Port Vale). Direct free kick taken right-footed by John McCombe (Port Vale) from own half, resulting in open play. 74:49 Defending throw-in by Kris Taylor (Port Vale). 74:05 Goal kick taken long by Stuart Tomlinson (Port Vale). 73:32 Substitution Port Vale substitution: Sean Rigg replaced by Kris Taylor (tactical). 73:12 Foul by Anthony Griffith (Port Vale) on Gary Borrowdale (QPR). Direct free kick taken right-footed by Matthew Connolly (QPR) from own half, resulting in open play. 72:31 Goal kick taken long by Stuart Tomlinson (Port Vale). 72:20 Shot by Jamie Mackie (QPR) right-footed from right side of penalty area (12 yards), missed left. 71:30 Goal kick taken long by Patrick Kenny (QPR). 70:57 Foul by Hogan Ephraim (QPR) on Anthony Griffith (Port Vale). Direct free kick taken right-footed by Gary Roberts (Port Vale) from right wing, shot by Marc Richards (Port Vale) right-footed from right side of six-yard box (6 yards), over the bar. 70:45 Attacking throw-in by Adam Yates (Port Vale). 70:20 Foul by Romone Rose (QPR) on Doug Loft (Port Vale). Direct free kick taken right-footed by Gary Roberts (Port Vale) from left channel, passed. 69:39 Attacking throw-in by Doug Loft (Port Vale). 69:09 Defending throw-in by Gary Borrowdale (QPR). 67:03 Goal kick taken long by Stuart Tomlinson (Port Vale). 66:52 Shot by Romone Rose (QPR) right-footed from right channel (25 yards), missed left. 66:08 Attacking throw-in by Bradley Orr (QPR). 65:02 Inswinging corner from right by-line taken left-footed by Gary Borrowdale (QPR) to near post, clearance by Anthony Griffith (Port Vale). 64:51 Attacking throw-in by Bradley Orr (QPR). 64:23 Defending throw-in by Bradley Orr (QPR). 63:28 Outswinging corner from right by-line taken right-footed by Gary Borrowdale (QPR) to near post, save (caught) by Stuart Tomlinson (Port Vale). 62:34 Substitution QPR substitution: Josh Parker replaced by Joe Oastler (tactical). 62:18 Substitution QPR substitution: Shaun Derry replaced by Romone Rose (tactical). 61:20 Assist (pass) by Matthew Connolly (QPR) from right channel. 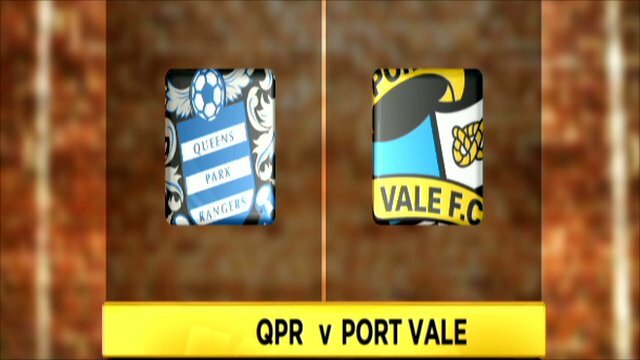 61:20 GOAL - Antonio German:QPR 1 - 3 Port Vale Goal by Antonio German (QPR) right-footed (bottom-left of goal) from right side of six-yard box (6 yards).QPR 1-3 Port Vale. 60:15 Goal kick taken long by Patrick Kenny (QPR). 59:24 Foul by Matthew Connolly (QPR) on Justin Richards (Port Vale). Free kick taken left-footed by Doug Loft (Port Vale) from left channel (30 yards), over the bar. 58:29 Goal kick taken long by Patrick Kenny (QPR). 58:14 Shot by Sean Rigg (Port Vale) left-footed from left channel (35 yards), missed left. 57:21 Attacking throw-in by Bradley Orr (QPR). 56:25 Foul by Jamie Mackie (QPR) on Doug Loft (Port Vale). Direct free kick taken right-footed by Stuart Tomlinson (Port Vale) from own half, resulting in open play. 56:11 Attacking throw-in by Gary Borrowdale (QPR). 54:41 Inswinging corner from right by-line taken left-footed by Gary Borrowdale (QPR) to centre, foul by Matthew Connolly (QPR) on John McCombe (Port Vale). Direct free kick taken right-footed by Stuart Tomlinson (Port Vale) from own half, resulting in open play. 54:13 Defending throw-in by Doug Loft (Port Vale). 53:28 Goal kick taken long by Stuart Tomlinson (Port Vale). 53:15 Shot by Antonio German (QPR) volleyed left-footed from left channel (25 yards), missed left. 52:38 Attacking throw-in by Doug Loft (Port Vale). 52:19 Inswinging corner from left by-line taken right-footed by Gary Roberts (Port Vale) to near post, clearance by Mikele Leigertwood (QPR). 51:29 Defending throw-in by Adam Yates (Port Vale). 50:15 Goal kick taken long by Stuart Tomlinson (Port Vale). 49:23 Attacking throw-in by Doug Loft (Port Vale). 47:40 GOAL - Justin Richards:QPR 0 - 3 Port Vale Goal by Justin Richards (Port Vale) left-footed (low centre of goal) from right side of six-yard box (6 yards).QPR 0-3 Port Vale. 47:40 Shot by Doug Loft (Port Vale) left-footed from left channel (25 yards), save (parried) by Patrick Kenny (QPR). 47:22 Defending throw-in by Adam Yates (Port Vale). 47:05 Defending throw-in by Gareth Owen (Port Vale). 46:32 Defending throw-in by Bradley Orr (QPR). 45:50 Foul by Matthew Connolly (QPR) on Marc Richards (Port Vale). Free kick crossed right-footed by Gary Roberts (Port Vale) from right channel, resulting in ball out of play. 45:01 Substitution QPR substitution: Leon Clarke replaced by Antonio German (tactical). 45:00+1:30 Defending throw-in by Gary Borrowdale (QPR). Correction - 45:00+0:53 Goal kick taken short by Patrick Kenny (QPR). 45:00+0:53 Goal kick taken long by Patrick Kenny (QPR). 45:00+0:28 Shot by Doug Loft (Port Vale) left-footed from right channel (25 yards), blocked by Matthew Connolly (QPR). 45:00+0:05 Corner from left by-line taken short right-footed by Gary Roberts (Port Vale). 44:28 Attacking throw-in by Josh Parker (QPR). 43:39 Goal kick taken long by Patrick Kenny (QPR). 43:25 Shot by Anthony Griffith (Port Vale) right-footed from right channel (25 yards), missed left. 42:57 Goal kick taken long by Patrick Kenny (QPR). 42:39 Attacking throw-in by Doug Loft (Port Vale). 42:13 Defending throw-in by Doug Loft (Port Vale). 41:02 Defending throw-in by Gary Borrowdale (QPR). 39:56 Attacking throw-in by Josh Parker (QPR). 39:20 Inswinging corner from right by-line taken left-footed by Gary Borrowdale (QPR) to near post, save (punched) by Stuart Tomlinson (Port Vale). 39:07 Inswinging corner from left by-line taken right-footed by Hogan Ephraim (QPR) to near post, clearance by Gareth Owen (Port Vale). 38:53 Shot by Josh Parker (QPR) right-footed from left side of six-yard box (6 yards), save (parried) by Stuart Tomlinson (Port Vale). 38:33 Attacking throw-in by Bradley Orr (QPR). 38:22 Defending throw-in by Bradley Orr (QPR). 37:39 Outswinging corner from right by-line taken right-footed by Gary Roberts (Port Vale) to near post, clearance by Shaun Derry (QPR). 35:42 Assist (pass) by Doug Loft (Port Vale) from left channel. 35:42 GOAL - Sean Rigg:QPR 0 - 2 Port Vale Goal by Sean Rigg (Port Vale) left-footed (bottom-right of goal) from left channel (18 yards).QPR 0-2 Port Vale. 34:36 Foul by Mikele Leigertwood (QPR) on Gary Roberts (Port Vale). Direct free kick taken right-footed by Gary Roberts (Port Vale) from own half, passed. 33:28 Attacking throw-in by Gary Borrowdale (QPR). 32:32 Free kick crossed right-footed by Gary Roberts (Port Vale) from left channel, save (caught) by Patrick Kenny (QPR). 32:32 Booking Fitz Hall (QPR) booked for unsporting behaviour. 32:32 Foul by Fitz Hall (QPR) on Justin Richards (Port Vale). 31:34 Goal kick taken long by Stuart Tomlinson (Port Vale). 29:17 Assist (pass) by Sean Rigg (Port Vale) from left channel. 29:17 GOAL - Justin Richards:QPR 0 - 1 Port Vale Goal by Justin Richards (Port Vale) left-footed (bottom-left of goal) from left side of penalty area (12 yards).QPR 0-1 Port Vale. 28:17 Attacking throw-in by Josh Parker (QPR). 27:58 Goal kick taken long by Patrick Kenny (QPR). 27:37 Shot by Gary Roberts (Port Vale) right-footed from right channel (25 yards), missed right. 27:11 Attacking throw-in by Adam Yates (Port Vale). 26:00 Shot by Jamie Mackie (QPR) left-footed from right side of six-yard box (6 yards), save (caught) by Stuart Tomlinson (Port Vale). 24:51 Inswinging corner from left by-line taken right-footed by Gary Roberts (Port Vale) to near post, clearance by Mikele Leigertwood (QPR). 24:23 Attacking throw-in by Doug Loft (Port Vale). 21:47 Foul by Shaun Derry (QPR) on Anthony Griffith (Port Vale). Free kick crossed right-footed by Gary Roberts (Port Vale) from left channel, clearance by Bradley Orr (QPR). 21:24 Attacking throw-in by Doug Loft (Port Vale). 20:19 Inswinging corner from left by-line taken right-footed by Hogan Ephraim (QPR) to far post, save (punched) by Stuart Tomlinson (Port Vale). 19:34 Attacking throw-in by Bradley Orr (QPR). 19:22 Defending throw-in by Bradley Orr (QPR). 18:36 Attacking throw-in by Gary Borrowdale (QPR). 18:19 Foul by Leon Clarke (QPR) on Lee Collins (Port Vale). Direct free kick taken right-footed by Gareth Owen (Port Vale) from own half, passed. 18:00 Attacking throw-in by Adam Yates (Port Vale). 17:26 Goal kick taken long by Stuart Tomlinson (Port Vale). 17:15 Shot by Jamie Mackie (QPR) right-footed from left channel (20 yards), over the bar. 16:50 Attacking throw-in by Adam Yates (Port Vale). 16:26 Defending throw-in by Adam Yates (Port Vale). 14:50 Foul by Fitz Hall (QPR) on Marc Richards (Port Vale). Direct free kick taken right-footed by Gary Roberts (Port Vale) from own half, resulting in open play. 13:45 Defending throw-in by Bradley Orr (QPR). 13:35 Foul by Shaun Derry (QPR) on Gary Roberts (Port Vale). Direct free kick taken right-footed by John McCombe (Port Vale) from own half, resulting in open play. 13:29 Defending throw-in by Adam Yates (Port Vale). 12:04 Goal kick taken long by Stuart Tomlinson (Port Vale). 10:15 Outswinging corner from right by-line taken right-footed by Gary Roberts (Port Vale) to near post, header by John McCombe (Port Vale) from right side of six-yard box (6 yards), hit bar. 9:52 Outswinging corner from right by-line taken right-footed by Gary Roberts (Port Vale) to near post, clearance by Mikele Leigertwood (QPR). 9:37 Attacking throw-in by Adam Yates (Port Vale). 9:26 Attacking throw-in by Doug Loft (Port Vale). 8:31 Leon Clarke (QPR) caught offside. Indirect free kick taken right-footed by Stuart Tomlinson (Port Vale) from own half, resulting in open play. 8:11 Shot by John McCombe (Port Vale) right-footed from right channel (20 yards), save (caught) by Patrick Kenny (QPR). 7:32 Shot by Marc Richards (Port Vale) right-footed from right channel (18 yards), blocked by Fitz Hall (QPR). Outswinging corner from right by-line taken right-footed by Gary Roberts (Port Vale) to far post, clearance by Fitz Hall (QPR). 7:08 Attacking throw-in by Doug Loft (Port Vale). 6:11 Shot by Leon Clarke (QPR) right-footed from right side of six-yard box (6 yards), save (parried) by Stuart Tomlinson (Port Vale). 5:10 Defending throw-in by Bradley Orr (QPR). 4:38 Attacking throw-in by Bradley Orr (QPR). 4:10 Attacking throw-in by Gary Borrowdale (QPR). 2:59 Foul by Gary Borrowdale (QPR) on Justin Richards (Port Vale). Free kick crossed right-footed by Gary Roberts (Port Vale) from right wing, save (caught) by Patrick Kenny (QPR). 2:43 Defending throw-in by Adam Yates (Port Vale). 1:09 Defending throw-in by Gary Borrowdale (QPR). 0:18 Attacking throw-in by Bradley Orr (QPR). The referee gets the second half started. The referee calls an end to the first half. The final whistle goes and the game is over.